Integrated meteorology-atmospheric chemistry models for the regional scale have been developed only recently and most modeling systems are still in a premature, not well tested state. To support the further development and to demonstrate the strengths and identify the weaknesses of current models, a thorough evaluation against observations or other known solutions is of great importance. The overall objective of WG4 is therefore to identify the specific needs for evaluation of integrated meteorology-chemistry models and to develop the necessary tools and methodologies. A further important objective is to provide recommendations on suitable applications of these modeling systems. 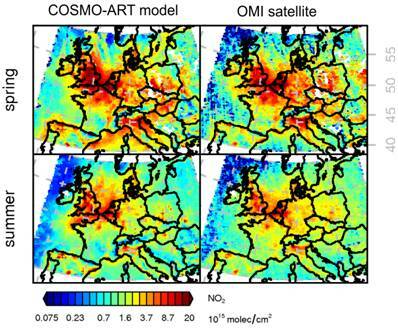 WG4 co-ordinated the European contribution to phase-2 of the Air Quality Modelling Evaluation International Initiative (AQMEII-2). 16 European modeling groups participated in the exercise operating 7 different coupled meteorology-chemistry models allowing for an unprecedented evaluation of this new generation of models and an assessment of the current state-of-the-art in this field. A list of the publications lead by members of WG4 is provided below. Baro et al. : Sensitivity analysis of the microphysics scheme in WRF-Chem contributions to AQMEII phase 2. Giordano et al. : Assessment of the MACC reanalysis and its influence as chemical boundary conditions for regional air quality modeling in AQMEII-2. These minutes contain the timeline for the AQMEII model evaluation exercise. Pages 8-11 are the minutes of the WG4 side meeting. The domain adopted for the European AQMEII simulations is called CORDEX_Europe_new and described on page 5 in this document.